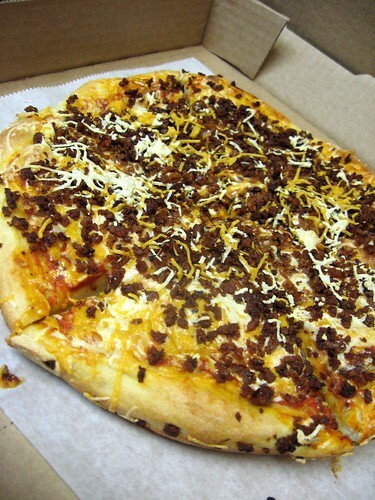 justthefood.com...the blog: Jason Ellis wants more Vegan Pizza! That pizza looks soo good! PS There is a giveaway on my blog- ends in a few days.. check it out! Holy pepperoni! Where have you been my entirevegan life! Your recipes are crazy dslicious looking and I bet they taste twice as good!!! Brilliant and awesome!!! The pepperoni was AWESOME! I was eating it with a spoon while I made the pizza. The only thing is, I made way too much. Is there anything else I can do with it? I don't want it to go to waste. Hi! I'm not sure why I've never been to your blog! I've been hearing about you on Celine's for ages...and I just bought y'all's book a few weeks ago. It's amazing! I can't believe you were on the Jason Ellis show. And I missed it. I have Sirius in my car and I love listening to him. Jade...It makes a nice and spicy addition to marinara on pasta! Bianca...I'll be back again, I will be teaching Rawdog how to cook soon, after they get back from Vegas for Ellismania. The pizza looks good and the fact that it is vegan makes me want to make something like this today!